A rediscovered neoclassical painting by Charles Meynier somersaulted nine times over its estimate to sell for €1.8m (£1.57m) at a sale in Nantes. Charles Meynier’s rediscovered painting 'The Departure of Telemachus', sold at Ivoire Nantes on March 27 for €1.8m (£1.57m). Seven bidders pursued it with a British buyer winning at €2.23m including premium. Meynier (1768-1832), a winner of the 1789 Prix de Rome, worked in Italy until 1793 when he returned to Paris, completing most of his bestknown works in the Consulate and Empire periods. The painting sold by the Ivoire Nantes firm Couton, Veyrac, Jamault was titled The Departure of Telemachus (or Telemachus, pressed by Mentor, leaves Calypso’s island). It had been exhibited by Meynier at the Salon of 1800. The multi-figure composition was widely acclaimed by the critics at the time who praised, the artist’s use of colour, the correctness of the drawing and the graceful faces of the subjects. 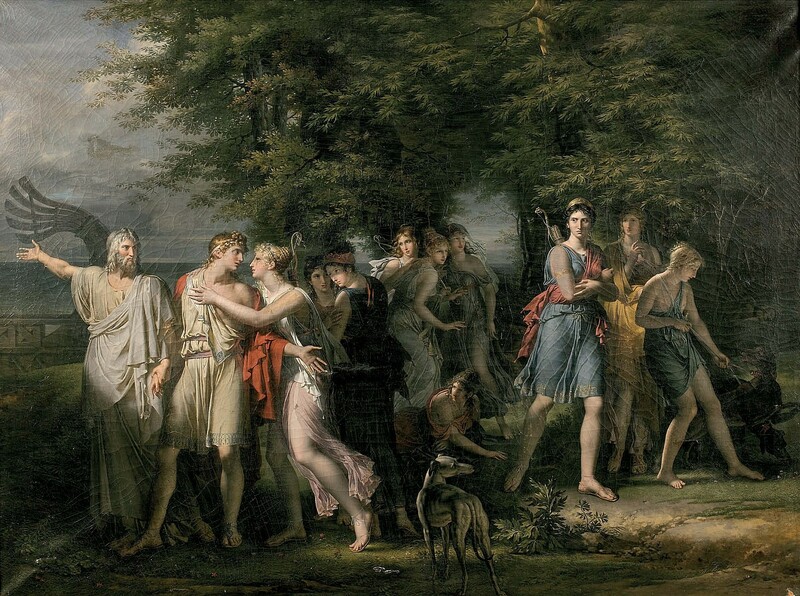 The 4ft 11in x 6ft 7in (1.5 x 2m) oil on canvas, which is signed lower left ch.meynier/ an.8, was purchased at the Salon for Fr4000 by the banker Joseph Fulchiron who already owned the artist’s Androcles, which he acquired at the 1795 Salon. The work was then lost for over 200 years and the image known to scholars only from an engraving. It emerged the work had been acquired in the early 1930s by the ancestors of the vendor and had remained in the same family until consigned for sale on March 27. The multi-estimate price sets an auction record, surpassing the $485,000 paid in 1997 at Christie’s New York for the artist’s Wisdom defending Youth against Love.